This page brings you the latest bird and wildlife sightings from Chew Valley Lake (and occasionally elsewhere). Every effort is made to keep the information on this page accurate, but it's quite possible that the odd stringy record slips in every now and then. A quick check of Herriott's Pool this morning produced the first-summer drake Goldeneye, a drake Ring-necked Duck and a newly-emerged brood of eleven Shelducks. Later in the day a flock of four Common Terns and an Oystercatcher appeared, but in a week that has already produced two unexpected rarities, a first-summer Black-throated Diver off Nunnery Point this evening was an equally surprising find. At least the crake and the oriole turned up at the right time of year! The warm, still weather over the last few days has provided ideal conditions for the growth of algae, and now Herriott's Pool is thick with the stuff. Unusually, a herd of non-breeding Mute Swans has taken to the pool; up to 41 birds were present this evening, along with 65 Gadwall and an oversummering drake Common Teal. A Sanderling on the main dam was a good, albeit predictable find, whilst a drake Goldeneye appeared almost a month after the last of the main passage. BLAGDON: Continuing the theme of heard-only scarce migrants, a remarkable find this afternoon was a Corncrake at Bell's Bush; heard calling for ten minutes, there was no further sight or sound of it by dusk. Still no sign of the Golden Oriole this morning. Otherwise, the rather feeble wader passage continued with four more Black-tailed Godwits and a Redshank. A motley collection of gulls on Herriott's Pool this evening comprised one first-winter Little, six Black-headed, one Herring and 268 Lesser Black-backs. 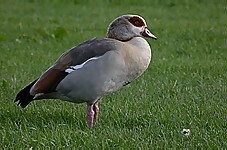 Once again, there was no sign of the Egyptian Goose at No.1 picnic site today. Although moth trapping takes place regularly at CVRS, an effort is being made this year to record lepidoptera at other sites and habitats around the lake. To this end, two more fairly common microlepidoptera were added to the list this evening; Elachista argentella and Eriocrania subpurpurella (mines). Highlight today was the surprise discovery of the lake's first Golden Oriole since the 1950s - heard singing at the southern end of the poplar wood this morning. Subsequent attempts to see or hear the bird unfortunately proved fruitless. Other birds included a Marsh Harrier in Stratford Bay, three Arctic Terns and single Common Sandpiper, Black-tailed Godwit and Dunlin. A brief spell of warm weather weather coaxed a few micro moths into action in Stichingshord Lane field, notably Micropterix calthella, Glyphipterix simpliciella and Glyphipterix fuscoviridella. A Painted Lady at Sutton Wick was the first of the year. One of the drake Ring-necked Ducks was still around; other birds reported were two Spotted Flycatchers, a Hobby, two Dunlin and a Common Sandpiper. Little to report, other than a flock of five Black-tailed Godwits and one Bar-tailed Godwit over Heron's Green Bay. The drake Ring-necked Duck was still on Herriott's Pool this afternoon, and a singing Cuckoo was still in Stratford Bay - this species has become very scarce in the last two years. The only reports today were of the Egyptian Goose and one of the Ring-necked Ducks both still present. The rain again brought several thousand Common Swifts and a good number of House Martins, though Swallows were notable by their comparative scarcity. The Slavonian Grebe was back in front of Moreton hide, and the drake Ring-necked Duck was again in Stratford Bay. A male Marsh Harrier appeared briefly this afternoon, but wholly unexpected was the discovery of an Egyptian Goose at No.1 Picnic Site this evening - the first since 1988. Two Dunlin, a Common Sandpiper and a Hobby were the only other birds of note. The Ring-necked Duck and Garganey were both still present, along with three Common Sandpipers. The partial albino Common Swift was seen again today, along with a Common Tern, two Dunlin (main dam), a Common Sandpiper and the drake Ring-necked Duck still. The Slavonian Grebe has now ventured as far as Stratford Bay - the only other birds reported were two Whimbrel and a Common Sandpiper. More of the same today, with the Ring-necked Duck and Garganey still on Herriott's Pool and the Slavonian Grebe again in Heron's Green Bay. A Little Ringed Plover was on the main dam, and Common Sandpipers were on the causeway in Heron's Green Bay (one) and the main dam (two). 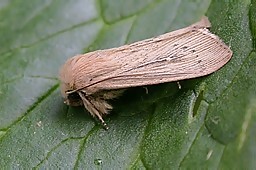 On the lepidoptera front, two White Ermines and a Pale Tussock were at the security lights on Woodford Lodge. The Garganey, Dunlin and one Arctic Tern remained from yesterday, whilst the drake Ring-necked Duck reappeared in Stratford Bay, and the Slavonian Grebe was refound in front of Moreton hide. Birds of the day however were two Red Kites seen by one lucky observer flying over Burledge Hill and Herriott's End - only the third record for the lake. The first damselfly of the year was a male Common Blue Damselfly in Moreton Lane. A single Small Copper was also on the wing there. Two Arctic Terns on the main lake were, surprisingly, the first of the year (the last of the five regular tern species to be recorded in 2003). A single drake Garganey and one Dunlin were on Herriott's Pool, with two Common Sandpipers in Stratford Bay the only other waders of note. Brief searches this evening failed to produce either the Slavonian Grebe or the Ring-necked Duck, but two drake Garganey on Herriott's Pool were new in, as were a pair of Dunlin in Heron's Green Bay. The male Ring-necked Duck was still at the back of Herriott's Pool this afternoon, and the transitional-plumage Slavonian Grebe was still along the north shore of Heron's Green. A Common Tern was on the main lake, and eight Whimbrel and one Bar-tailed Godwit were present on the main dam - the latter a difficult bird to see at Chew. Other birds included a pair of Ravens, two Hobbies and a second-summer Yellow-legged Gull. The drake Ring-necked Duck has returned to Herriott's Pool, with the Slavonian Grebe still in Heron's Green Bay. Other birds included a Wood Warbler trapped at CVRS (only the fourth ever ringed at Chew), a Spotted Flycatcher in the alder wood behind Stratford hide, three fly-through Whimbrel, the first-winter Mediterranean Gull still (Herriott's Pool), five Common Sandpipers and a singing Cuckoo in Stratford Bay, and a Black Tern on the main lake. Nearby, a smart male tenebrosus type Common Pheasant was again seen by the A368 at Stanton Wick. Wind and showers produced the expected flocks of hirundines and Common Swifts; amongst the latter was a striking partial albino bird, with a white back and rump, and a white belly patch and vent. Other birds included the first-winter Mediterranean Gull still (only the second May record for the lake), a Common Tern, and a Hobby in Stratford Bay. The tame female Mandarin was still with Mallards at Picnic Site No1.